SNEW's fourth catchy and hard rocking album sets the phasers to stun and grabs you by the booboo. 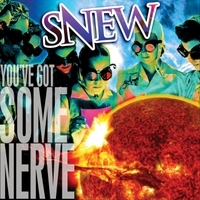 SNEW’s much anticipated fourth album is titled “You’ve Got Some Nerve”. Recorded in the Hollywood Hills and produced by Bobby Owsinski, engineered by Grammy winner J. J. Blair. This is perhaps the bands most ambitious work to date. SNEW even includes a live horn section on two tracks. The album kicks off with the Ultra Catchy and Rocking “UR Freaking Me Out” which sets the tone for an album that takes you through Arena Rock anthems like “Holy Hell”, the pure Heavy Metal of “Acetylene Queen”, the Angst Driven and Complex “Put Upon”, Catchy and Dance-able “Sharpie” and the Moody and Spaced out “Revolution is a Closed Loop”. Nine tracks in all with a CD package that includes visually stunning artwork. SNEW are at the top of their game.